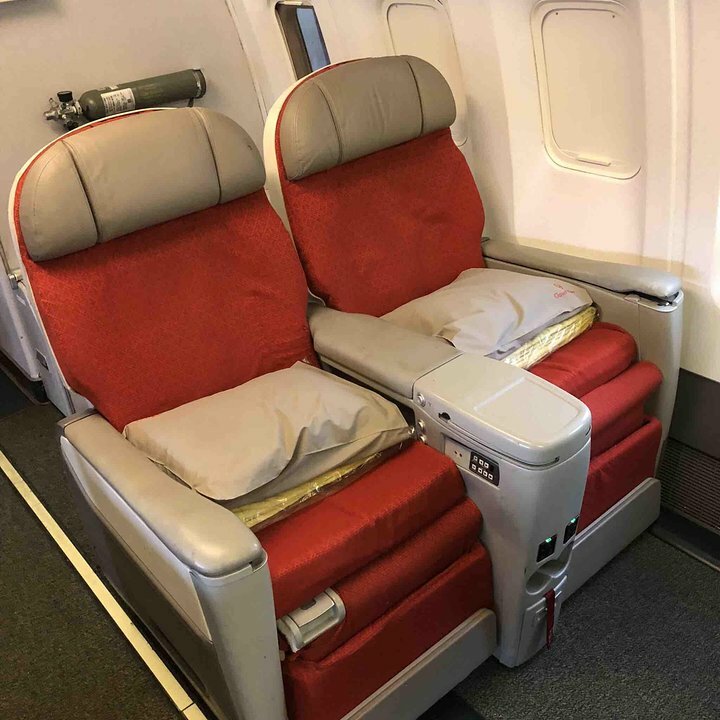 1 A None No Power Seat 1 A is a standard recliner-style Business Class seat located at a bulkhead. Floor storage for personal effects is not available for use during takeoff and landing. The proximity to the galley and lavatory area might be bothersome. A bassinet might be installed on the bulkhead, therefore, a passenger traveling with an infant might be seated in this row. 1 C None No Power Seat 1 C is a standard recliner-style Business Class seat located at a bulkhead. Floor storage for personal effects is not available for use during takeoff and landing. The proximity to the galley and lavatory area might be bothersome. A bassinet might be installed on the bulkhead, therefore, a passenger traveling with an infant might be seated in this row. 1 D None No Power Seat 1 D is a standard recliner-style Business Class seat located at a bulkhead. Floor storage for personal effects is not available for use during takeoff and landing. The proximity to the galley and lavatory area might be bothersome. A bassinet might be installed on the bulkhead, therefore, a passenger traveling with an infant might be seated in this row. 1 H None No Power Seat 1 H is a standard recliner-style Business Class seat located at a bulkhead. Floor storage for personal effects is not available for use during takeoff and landing. The proximity to the galley and lavatory area might be bothersome. A bassinet might be installed on the bulkhead, therefore, a passenger traveling with an infant might be seated in this row. 1 J None No Power Seat 1 J is a standard recliner-style Business Class seat located at a bulkhead. Floor storage for personal effects is not available for use during takeoff and landing. The proximity to the galley and lavatory area might be bothersome. 1 L None No Power Seat 1 L is a standard recliner-style Business Class seat located at a bulkhead. Floor storage for personal effects is not available for use during takeoff and landing. The proximity to the galley and lavatory area might be bothersome. 11 A None No Power Seat 11 A is a standard Economy Class seat located at a bulkhead. The seat features additional legroom and personal space due to no seat back recline intrusion from the front. The tray table and inflight entertainment monitor are installed in a fixed armrest, therefore, seat width is slightly reduced. Floor storage for personal effects is not available for use during takeoff and landing. The proximity to the galley and lavatory area might be bothersome. A bassinet might be installed on the bulkhead, therefore, a passenger traveling with an infant might be seated in this row. 11 C None No Power Seat 11 C is a standard Economy Class seat located at a bulkhead. The seat features additional legroom and personal space due to no seat back recline intrusion from the front. The tray table and inflight entertainment monitor are installed in a fixed armrest, therefore, seat width is slightly reduced. Floor storage for personal effects is not available for use during takeoff and landing. The proximity to the galley and lavatory area might be bothersome. A bassinet might be installed on the bulkhead, therefore, a passenger traveling with an infant might be seated in this row. 11 D None No Power Seat 11 D is a standard Economy Class seat located at a bulkhead. The seat features additional legroom and personal space due to no seat back recline intrusion from the front. The tray table and inflight entertainment monitor are installed in a fixed armrest, therefore, seat width is slightly reduced. Floor storage for personal effects is not available for use during takeoff and landing. The proximity to the galley and lavatory area might be bothersome. A bassinet might be installed on the bulkhead, therefore, a passenger traveling with an infant might be seated in this row. 11 F None No Power Seat 11 F is a standard Economy Class seat located at a bulkhead. The seat features additional legroom and personal space due to no seat back recline intrusion from the front. The tray table and inflight entertainment monitor are installed in a fixed armrest, therefore, seat width is slightly reduced. Floor storage for personal effects is not available for use during takeoff and landing. The proximity to the galley and lavatory area might be bothersome. A bassinet might be installed on the bulkhead, therefore, a passenger traveling with an infant might be seated in this row. 11 H None No Power Seat 11 H is a standard Economy Class seat located at a bulkhead. The seat features additional legroom and personal space due to no seat back recline intrusion from the front. The tray table and inflight entertainment monitor are installed in a fixed armrest, therefore, seat width is slightly reduced. Floor storage for personal effects is not available for use during takeoff and landing. The proximity to the galley and lavatory area might be bothersome. A bassinet might be installed on the bulkhead, therefore, a passenger traveling with an infant might be seated in this row. 11 J None No Power Seat 11 J is a standard Economy Class seat located at a bulkhead. The seat features additional legroom and personal space due to no seat back recline intrusion from the front. The tray table and inflight entertainment monitor are installed in a fixed armrest, therefore, seat width is slightly reduced. Floor storage for personal effects is not available for use during takeoff and landing. The proximity to the galley and lavatory area might be bothersome. A bassinet might be installed on the bulkhead, therefore, a passenger traveling with an infant might be seated in this row. 11 L None No Power Seat 11 L is a standard Economy Class seat located at a bulkhead. The seat features additional legroom and personal space due to no seat back recline intrusion from the front. The tray table and inflight entertainment monitor are installed in a fixed armrest, therefore, seat width is slightly reduced. Floor storage for personal effects is not available for use during takeoff and landing. The proximity to the galley and lavatory area might be bothersome. A bassinet might be installed on the bulkhead, therefore, a passenger traveling with an infant might be seated in this row. 18 H None No Power Seat 18 H is a standard Economy Class seat. Seat back recline is limited due to the Exit Row directly behind. 18 J None No Power Seat 18 J is a standard Economy Class seat. Seat back recline is limited due to the Exit Row directly behind. 18 L None No Power Seat 18 L is a standard Economy Class seat. Seat back recline is limited due to the Exit Row directly behind. 19 A None No Power Seat 19 A is a standard Economy Class seat located in an Exit Row. There is additional legroom and personal space due to no intrusion from seat back recline from the front. The tray table and inflight entertainment monitor are installed in the armrest, therefore, seat width is slightly reduced. Floor storage for personal effects might not be available for use during takeoff and landing. 19 C None No Power Seat 19 C is a standard Economy Class seat located in an Exit Row. There is additional legroom and personal space due to no intrusion from seat back recline from the front. The tray table and inflight entertainment monitor are installed in the armrest, therefore, seat width is slightly reduced. Floor storage for personal effects might not be available for use during takeoff and landing. 19 D None No Power Seat 19 D is a standard Economy Class seat located in an Exit Row. There is additional legroom and personal space due to no intrusion from seat back recline from the front. The tray table and inflight entertainment monitor are installed in the armrest, therefore, seat width is slightly reduced. Floor storage for personal effects might not be available for use during takeoff and landing. 19 F None No Power Seat 19 F is a standard Economy Class seat located in an Exit Row. There is additional legroom and personal space due to no intrusion from seat back recline from the front. The tray table and inflight entertainment monitor are installed in the armrest, therefore, seat width is slightly reduced. Floor storage for personal effects might not be available for use during takeoff and landing. 19 H None No Power Seat 19 H is a standard Economy Class seat located in an Exit Row. There is additional legroom and personal space due to no intrusion from seat back recline from the front. The tray table and inflight entertainment monitor are installed in the armrest, therefore, seat width is slightly reduced. Floor storage for personal effects might not be available for use during takeoff and landing. 19 J None No Power Seat 19 J is a standard Economy Class seat located in an Exit Row. There is additional legroom and personal space due to no intrusion from seat back recline from the front. The tray table and inflight entertainment monitor are installed in the armrest, therefore, seat width is slightly reduced. Floor storage for personal effects might not be available for use during takeoff and landing. 19 L None No Power Seat 19 L is a standard Economy Class seat located in an Exit Row. There is additional legroom and personal space due to no intrusion from seat back recline from the front. The tray table and inflight entertainment monitor are installed in the armrest, therefore, seat width is slightly reduced. Floor storage for personal effects might not be available for use during takeoff and landing. 2 H None No Power Seat 2 H is a standard recliner-style Business Class seat. 2 J None No Power Seat 2 J is a standard recliner-style Business Class seat. 3 H None No Power Seat 3 H is a standard recliner-style Business Class seat. 3 J None No Power Seat 3 J is a standard recliner-style Business Class seat. 38 A None No Power Seat 38 A is a standard Economy Class seat located in the last row of the aircraft. Seat back recline might be limited due to the wall directly behind. The proximity to the galley and lavatory area might be bothersome. 38 C None No Power Seat 38 C is a standard Economy Class seat located in the last row of the aircraft. Seat back recline might be limited due to the wall directly behind. The proximity to the galley and lavatory area might be bothersome. 38 J None No Power Seat 38 J is a standard Economy Class seat located in the last row of the aircraft. Seat back recline might be limited due to the wall directly behind. The proximity to the galley and lavatory area might be bothersome. 38 L None No Power Seat 38 L is a standard Economy Class seat located in the last row of the aircraft. Seat back recline might be limited due to the wall directly behind. The proximity to the galley and lavatory area might be bothersome. 39 D None No Power Seat 39 D is a standard Economy Class seat located in the last row of the aircraft. Seat back recline might be limited due to the wall directly behind. The proximity to the galley and lavatory area might be bothersome. 39 F None No Power Seat 39 F is a standard Economy Class seat located in the last row of the aircraft. Seat back recline might be limited due to the wall directly behind. The proximity to the galley and lavatory area might be bothersome. 39 H None No Power Seat 39 H is a standard Economy Class seat located in the last row of the aircraft. Seat back recline might be limited due to the wall directly behind. The proximity to the galley and lavatory area might be bothersome. 4 A None No Power Seat 4 A is a standard recliner-style Business Class seat. The proximity to the galley and lavatory area might be bothersome. 4 C None No Power Seat 4 C is a standard recliner-style Business Class seat. The proximity to the galley and lavatory area might be bothersome. 4 D None No Power Seat 4 D is a standard recliner-style Business Class seat. The proximity to the galley and lavatory area might be bothersome. 4 H None No Power Seat 4 H is a standard recliner-style Business Class seat. The proximity to the galley and lavatory area might be bothersome. 4 J None No Power Seat 4 J is a standard recliner-style Business Class seat. The proximity to the galley and lavatory area might be bothersome. 4 L None No Power Seat 4 L is a standard recliner-style Business Class seat. The proximity to the galley and lavatory area might be bothersome. Video on the Ethiopian Airlines Boeing 767-300ER is provided through personal inflight entertainment monitors at every seat. A variety of films, television shows, documentaries, short topic presentations, and a map detailing inflight progress are displayed. Ethiopian Airlines Boeing 767-300ER is an extended range widebody aircraft used for long-haul flights. 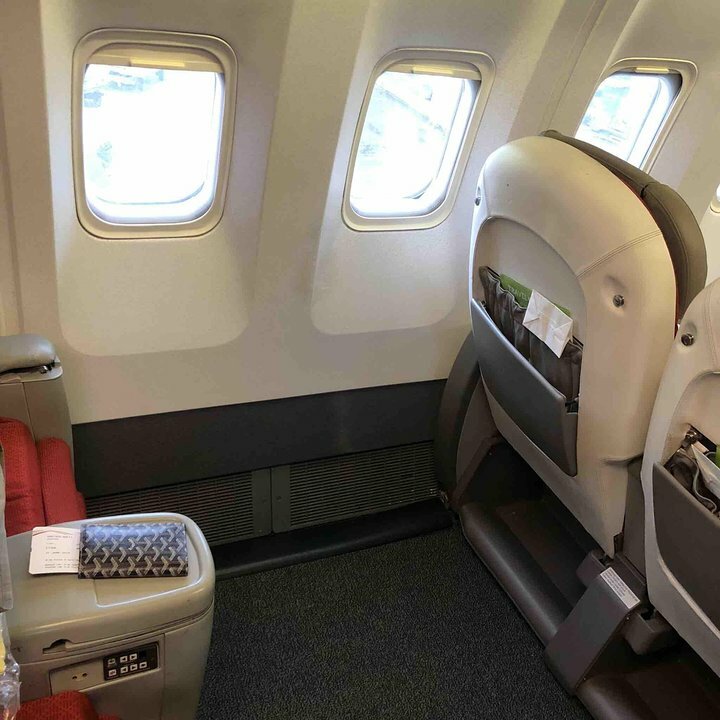 Passenger seating is configured in Cloud Nine Business Class and Economy Class. Entertainment onboard is provided via personal monitors in Cloud Nine and seat individual seat back monitors in Economy. 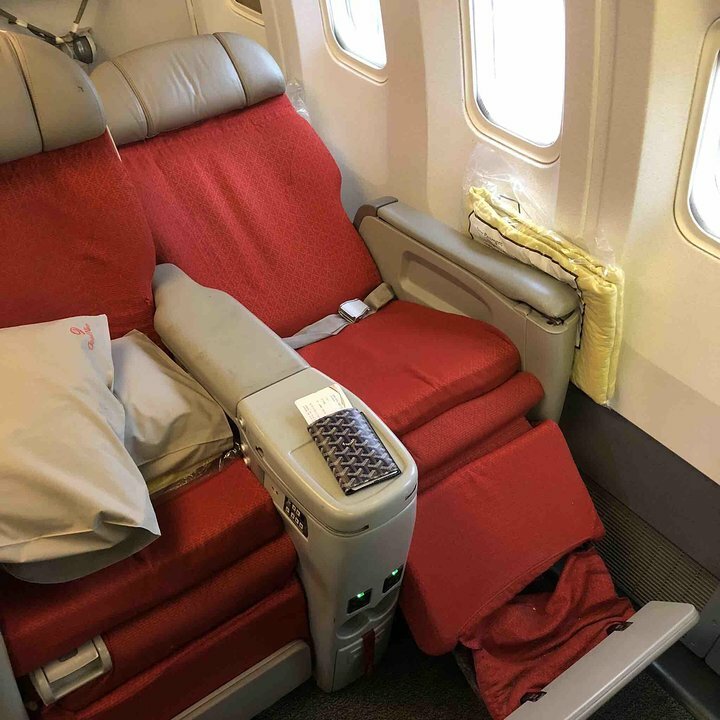 The 767 I took for both outbound and return had lie flat seats that were brand new. Six across makes for somewhat narrow seats for business class, but it was perfect for sleeping nevertheless even though I am 190 cm height and 92 kg. I had trouble figuring out the entertainment system, but probably could have done so had I been interested in using it (I mostly wanted to sleep on the 6 hour red eye flight). It was a fabulous experience, especially since I was expecting just recliner seats. 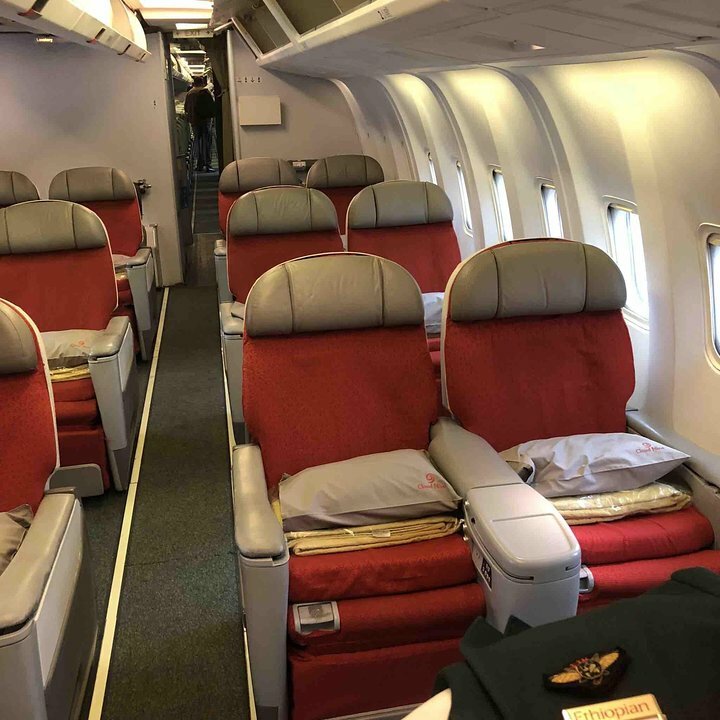 Ethiopian Airlines flies 1 versions of Boeing 767-300ER.